Back to School, Video Style. A recent request from B&H to do something for Back to School got me to thinking. What if I were headed off to college to get my Communications degree today? What would I really want to know? These days, students in the video programs at most universities have opportunities that are far easier in one respect than what I had: their smartphone probably does perfectly decent HD video. Still, B&H’s request got me thinking about what I’d do today if I were a Communications major trying to get as far as I can as fast as I can these days. Article on dslrbodies.com. ACR 8.6 and Lightroom 5.6 Released. The two-week-old issue with D810 raw file workflow is over for some. Or is it? Article on dslrbodies.com. Wow, Those Lens Rebates are Transparent. NikonUSA announced their bundle rebates for August. Yes, you can now bundle your D810 with a lens and get a rebate. Article on dslrbodies.com. The D7000 Guide is back as a download. After wrestling with Adobe Acrobat and struggling to a draw, the Complete Guide to the Nikon D7000 is back. Other books will have to wait until September to get their wrestling match with Acrobat resolved, sorry. Order on dslrbodies.com. Cine200 Tungsten Film. Article on filmbodies.com. Missed Opportunities. I’ve been reading financial analysts’ opinions recently on Nikon’s announced plans for the future, particularly about acquisitions in the medical area. This got me to thinking about the acquisitions they didn’t make. Article on dslrbodies.com. Day 12 of D810 Workflow Wait. Now that the D810 is showing up as “in stock” everywhere, Nikon might be wondering why the camera isn’t selling out. Can I suggest one possibility? The software to support it isn’t there. How many people need a 36mp JPEG camera? Article on dslrbodies.com. Every Choice is a Problem. A reader sent me a response to one of my articles yesterday, and I was struck by a line in it: “all [choices] have some nearly disqualifying problem.” Article on dslrbodies.com. The Corollary Position on More Pixels. Last week I posted an article on sansmirror.com about why 16mp might be enough resolution for most people. A corollary position to that exists, and I’ll discuss today. Article on dslrbodies.com. Almost Four Months Later. Registered D600 owners in the US received an email from NikonUSA this week. The email? Essentially an update of Nikon's service advisory for the camera, dated March 28, 2014. Article on dslrbodies.com. Warning About D810 Comparisons. You can already find them all over the Internet: D800 versus D810 comparisons. These come in two forms, both of which have some implicit problems you need to consider. Article on dslrbodies.com. The sRaw Myth. Too bad that sRaw has the word “raw” in it ;~). That seems to be causing all the problems with people understanding what it is. Article on dslrbodies.com. How Many Megapixels? A few years back an Olympus executive made the statement that digital cameras really only needed 12mp and implied that Olympus wouldn’t go further than that with m4/3. Of course, we’re at 16mp now with m4/3, so that didn’t exactly work out as expected, did it? Article on sansmirror.com. Is Capture NX-D Good Enough? Capture NX-D 1.0.0 is now released. Article on dslrbodies.com. Why Sunny 16 is Still Important. Before we had light meters in cameras, we had Sunny 16: set the aperture to f/16 and the shutter speed to 1/ISO in mid-day sunlight. Article on sansmirror.com. Window, Mirror, or at Other Cars? Let me try an analogy for you. When you’re in a competitive market, where are your designers looking? Article on dslrbodies.com. Nikon Surveys. While wandering around the NikonUSA site the other day trying to find a specific piece of information, I noted something that’s been in place for awhile, but is now starting to become a bit clearer. I’m talking about the “Take the Nikon X survey” links. Article on dslrbodies.com. A Simple Software Proposal. Updated. Not a single camera company has really managed to get workflow of traditional cameras right for the Internet age, particularly with WiFi. Article on dslrbodies.com. Is Pursuit of High ISO a Fool’s Errand? Someone asked me why I haven’t picked up a Sony A7s yet. My answer startled them: I see really high ISO values as mostly useless. Article on dslrbodies.com. Nikon V3 Review. The V3 is the third generation high-end camera in the Nikon 1 lineup. 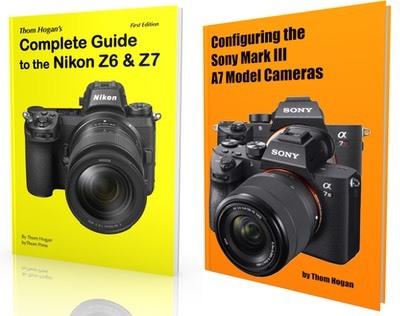 As with the V2, it is quite different than the camera that preceded it, which seems to indicate that Nikon is still scrambling to figure out what sticks and will resonate with consumers. Article on sansmirror.com. Nikon View NX2 Updated. Article on dslrbodies.com. Is the Nikon Flagship Model Broken? Since the F3 (and maybe even the F2 with a few caveats), Nikon’s modus operandi has been to iterate the high end pro camera on a fixed schedule and then trickle down the new technology it introduced to the lower models. In the film world, those flagship iterations came on 8 year boundaries; in digital the timeframe has been 4 years. In both cases, the goal was to have a new technologically-evolved top end camera available sometime in the year before the Summer Olympics. Article on dslrbodies.com. The Photos are Dead Myth. A pair of articles that appeared last week brought to the fore two competing thoughts that seem to be making the rounds. Article on dslrbodies.com. The Canon/Nikon Problem. Many have commented about the inability of Canon and Nikon to dominate mirrorless cameras. But it’s not an inability, it’s a dilemma. Article on sansmirror.com. So Which Camera? We had a spurt of high-end mirrorless cameras in the last year: Fujifilm X-T1, Olympus E-M1, Panasonic GH4, Sony A7s/A7/A7r. To those, some might add the Nikon V3 and the Sony A6000. The quick operative question is this: which one do you pick? Article on sansmirror.com. Leica M (Type 240) Firmware Update. Leica made a fairly extensive update of the Leica M (Type 240) camera firmware. Article on sansmirror.com. CIPA Numbers Still Trending Down. If the camera companies didn’t already realize that the tailspin is continuing unabated, they should now. Plus a discussion of what Nikon should do about it. Article on dslrbodies.com. Buy and Buy More. NikonUSA has already leaked it’s upcoming “Switch and Save” promo for the D810, though it’s much more like Buy and Buy More. Article on dslrbodies.com. D810 Questions and Answers. Question: why did Nikon change the filter used over the sensor in the D800E to a different one in the D810? Article on dslrbodies.com. Subscription versus Standalone. A lot of photography users are balking at the move from packaged software to subscriptions. Article on dslrbodies.com.